Ponencia presentada en el XVIllth. International Congress of the History of Science, realizado en la ciudad de Hamburgo, Repúblia Federal de Alemania, el día 4 de agosto de 1986. Between 1946 and 1950, a group of outstanding U.S. archaeologists who worked for several of the most important American institutions in the field, initiated jointly the great excavations in the ruins of Zaculeu, Guatemala. The organization, financial support, publications and the direction of the works were in the hands of the United Fruit Company, a banana-railway-shipping well-known enter prise. This work is still today the most discussed one carried out in Central America during post-war times, and it allows for comprehending the core of the usual lack of understanding between American and Latin American scholars. The project, development, and the role played before, during and after the works by the United Fruit, the kind of excavation and restoration accomplished, the relation of the archaeologists with this company, with the government and with the people, was all deeply rooted in politics and economy, going far beyond archaeology itself, and finally even determining the job accomplished. This might well be a speculation, but I dare say that the scientists involved never realized what this work really meant; with the certainty that they were doing pure science, an archaeology of a high scientific level, they got to believe they had nothing to do with the explosiva reality of those times in Central America. The archaeological works in Zaculeu were carried out during difficult times of the Guatemalan history in this century: the years of the Revolution. We shall not analyze the Revolution as such, but it will help to have an idea of what was going on in Guatemala at the moment. In 1945 the country had 3.487.444 inhabitants, 55% of which were indians; more than 1.5 million of them still talked in their aboriginal languages. In some departments, such as Totonicapan, 96% of the population spoke indigenous tongues, and only a minority knew some Spanish (Strebel and Dittel 1947). In 1950 (Shattuck 1938, Teller and Bendt 1977), a 33% of the population suffered some form of malaria, which was the cause of 19% of the deaths. The 89% of the deceased had lacked any kind of medical attention, and for more than 82%, there has not been a legal death certificate. The medical – patient relation in the country was one doctor each 32.437 inhabitants. The 65% of the population was totally illiterate, and in Sololá the percentage was of 88. In 1950, the lack of medicines provoqued 38% of the deaths, caused by infectious illnesses which could have been easily cured with some elemental facilities (Molina Abril 1971, Galích 1956). The salaries before the Revolution ranged between 5 to 10 cents of dollar a day. After 1944, the Revolution forced big companies to increase these amounts, and by 1950 workers were receiving 1.40 dollars a day. We should bare in mind that coffee plantations occupied about 425.000 workers. The countries per capita income was of 70 dollars a year for natives, and of 246 dollars for white people (Dirección General de Estadísticas 1940, Tax 1953, Consejo Nacional de Planificación 1950 and 1964), with an average of more than 2 dollars a day for post-revolutionary times, that is in 1953 and 1954. As to land property, they suffered the same inequalities: 76% of the country farms had less than 5 hectares and represented only a 10% of the territory; on the other hand, 2,2% of the landowners had 70,6% of the national territories. There were 161.500 farms of less than 2 hectares; most of the farmers could not obtain from their parcels the mínimum necessary for subsistance (Galich 1956, Melville 1971). The situation of political instability can also be seen through statistical data: since the Republic was signed in 1847, and until the fall of Arbenz’s democratic government in 1954, the country had had 22 presidents and 6 military boards. There had been only two clean elections: those of the Revolution. In this period they went through 10 wars with neighbor countries, 3 revolutions, 10 military uprisings, 3 coups d’état, 1 foreign invasion and 100 aborted revolutionary attemps, 50 of them between 1944 and 1954. Besides, they suffered 2 earthquakes and 11 foreign interventions (Galich 1956, Atitlán 1954, Arévalo 1954). A number of social rights were achieved after the 1944 Revolution, including the right to form unions, social security, a mínimum salary, the right to strike, paid vacations, free Sundays, medical tare and a compensation for layoffs, among others. Up to 1944, Decrete 1474 had been in force, by which workers were forced to work with no pay for the government, in a sneaky way of perpetuating slavery. In 1955 the country had 328 km of pavings and 1156 km of just one narrow trail. The 57% of national gross incomes carne from agriculture; 83,2% of exporte went to the United States; 85,2% of coffee was sent to that country, and this was the major product exported. There are other statistics that show the social situation existing before the Revolution and how this begun to change. For instante, primary and secondary education used to be under a military régime; in the country estates it was established a compulsory recruiting, and indians had to work at least one month a year, unpaid, in road building. They had no free Sundays and no regulations as to daily schadules or working conditions. The local market, economically, was almost inexistent because of the poor purchasing power. The per capita product in 1943 was of 55,57 dollars and the consumption still less: 47,95 dollars in that same year. Four international companies controlled the banana production, the railways, the telephones and telegraphs, insurances and broadcasts, and the four of them were from the United States. Two of the four were branches of the United Fruit Co., that controlled the Electric Bond and Share and the International Railways of Central America (Kepner and Soothill 1957). In short, this was the country where United Fruit organized a huge ar­chaeological field work, accomplished by first rate U.S. archaeologists and with a wide international diffusion. There is a wide bibliography concerning the installation and functioning of this enterprise in the country; however, this issue still raises controversies. And in general, the lack of an ample assent has little to do with different historical positions; it is rather connected with the defense or attack against the type of enterprise and economic policy it represented, and the negative or affirmative possibility that big foreign industries became involved in the internal matters of those countries in which they were operating. Even in the United States, this has been changing according to the different administrations in this century, with a higher or lesser attitude of approval toward these matters. In the different countries of the continent, the governments made their own moves, and military dictatorships usually granted their unconditional support to transnational capitals, while democracies stood against them. There has been a lot of different positions in between. But United Fruit was not just another enterprise. It was created in 1899 and by 1910 it already controlled 80% of the total banana production in Central America: Honduras, Guatemala, Cuba, Nicaragua, Jamaica and El Salvador belonged to its area of exploitation, among others. And as a rule in those countries, banana sometimes represented 50% of their total income. United Fruit also had subsidiaries: in Guatemala the most important branch was International Railways of Central America (IRCA) which was the owner of the country’s railways. The power of both of them consolidated jointly, as United Fruit had entered in the country as a shipping enterprise, La Gran Flota Blanca controlling banana exports to the United States. In 1901, dictator Estrada Cabrera granted the monopoly of maritime transportation, and in 1904 the monopoly of the train was established favouring the Guatemala Railways, founded by Minor C. Keith, one of the owners of United Fruit; later on, it was to be called IRCA (May and Plaza 1958, Kepner and Soothill 1957, McCann 1979). Dictator Estrada Cabrera favoured the enterprise granting the concession of the telegraph, the exploitation of the only national harbor, of several thousand hectares of land, and among other things, gave total and definite custom’s tax exemptions; this included the railways sections already built by the state together with the full equipment. By this time, banana plantations were beginning to grow, though on the papers the ownership was of third parties. Parallelly, in neighbor Honduras, a new banana enterprise had been created by Samuel Zemurray, with the support of United Fruit, with the name of Cuyamel Company. Between 1911 and 1913 these two companies competed fiercely for the conquest of new territories in other countries, though 60% of Zemurray’s initial capital carne from United Fruit. The struggle became more serious when during Davila’s revolution the enterprises decided to support opposite political sectors, thus almost leading to a formal declaration of war between the two countries; the role played by the enterprises has already been well studied (Atitlán 1954, Toriello, 1955). In short, Zemurray managed to obtain the majority of shares of the United in 1929 and in 1932 was appointed director of the merge of both conglomerates under the name of United Fruit. In 1913 banana exports in Guatemala had been of 3.444.036 bunches; in 1932 these had increased to 9.248.000 (Kepner and Soothill 1957). Taxes paid to the country for coffee were of 8,5% in 1928; however, United Fruit paid for banana not more than 1,97%. This means that coffee paid 13% of the total income, while banana paid only a 0,25%. Throughout these years, the control and influence of United Fruit on governments was remarkable. When Carlos Herrera’s administration tried to build a national railway to El Salvador, his government collapsed immediately. The new general in command took as one of his first actions, the decision to buy for 1.5 million dollars part of the lands that had been given to United Fruit; and as a favor to the enterprise, the state declined its legal right to administrative inspections! In 1931, the United, and particularly the Tropical Radio and Telegraph, had a lot to do in the acceptance of dictator Ubico and his revolution, a matter which was timely denounced (Arévalo 1954). Many things could be said on the role played by this enterprise and its subsidiaries in the country. For sure, some must have exaggerated and some must have minimized the problems. But no doubt, for a Guatemalan citizen, United Fruit must have embodied the majority and the worst part of his everyday problems. However, it is difficult to say how many of these problems were due to the enterprise and how many to the corrupted governments that accepted to play the gane; but I would like to point out what kind of image people had of this company. For the majority of the population, United Fruit was the only contact they had with the western world beyond their national frontiers, particularly the thousands of indian families who didn’t even know the Spanish language, and who lived without any kind of education or contact with the outer world. Within the banana plantations, the life of complete generations passed by, in an outmost misery. In 1944, a series of social and political events put an end to the dictatorship of Ubico, and mass movements led to democratic elections. It was the first time in the history of the country that candidates could step forth with no censorship or prohibitions. Juan Arévalo was elected president by a great majority of votes. This met the approval of Roosevelt’s administration, in the times of the “good neighbor” policy. Arévalo begun with a number of reforms: he finished with the legislation of obligatory personal services, he created the Labor Code, he opened the Bank of Guatemala, gave the municipal autonomy, and the Constitution of 1944. The Ministries of Economy, Labor and Social Security were created, the Houses for Children, the Model Federal Schools, the National Institute of Anthropology and History, the Indigenist Institute and the Museum of Antigua. At the same time, the University was transformed. We can also add the opening of the Editing Center and the issue of some collections of books. There was an out-standing increase in publications on archaeology, anthropology and indigenism, as well as in studies and field works with researchers of all over the world. The magazine Antropología e Historia is a good systematic example of the work accomplished in those years. These changes provoqued a profound transformation in the internal market and in the possibilities of approaching to culture, public health and income. If the last national balance before the Revolution -1943- gave a per capita income of 55 dollars, that of 1953 was of 163. Guatemala was changing, and this caused deep disturbances at all levels. Arévalo’s successor, also democratically elected, was Arbenz, whobecame president at 36 years of age, after a brilliant academic career in culture. Undoubtedly, Arbenz’s project has been revolutionary, but it was clear that, as he said en 1951, his intention was “to transform Guatemala, an old fashioned country with an almost feudal economy, in a capitalist nation” (Gobierno de Guatemala 1951). His best contribution was the Agrarian Reform, which damaged the interests of powerful landowners and gave land to more than 100.000 indians in only two years. This meant that half a million people could achieve food self-sufficiency, without having to depend exclusively on the work in the plantations. United Fruit Company was very much disturbed with all these changes: almost 150.000 hectares of land which had never been farmed and which had been donated to the company half a century before, were nationalized after a payment done in 1953. And though something that had beer given as a gift was even paid for, this added anyway to the malaise of the enterprise for the strikes, the unions and the obligation to pay a minimum salary, vacations and social security. In the meantime, an investigation of the International Monetary Fund brought to light that the company had been defrauding the national treasury, both in Guatemala and the United States -where the investigation had been promoted- during several years (Adler, Schlesinger and Olson 1952). In 1946 they had concealed 50% of their exports for an amount of 10.5 million dollars; in 1947, 19 millions were missing, and another 21 millions in 1948. In 1950 their net income had reached 50 million dollars. We don’t have to say this raised a big scandal, and was another contribution to the evil image of the company. To smashmonopolies, Arévalo used a different strategy than the natio­nalization of land; the road to the Atlantic begun to be built, pa­rallel to the railway, which was the only means up to then to leave the country; he also begun the construction of the Santo Tomás harbor, inasmuch as the only two existing ones (including the ownership of the land of the entire area) belonged to United Fruit, and the construction of the Hydroelectrical Marinalá was also started. The link of United Fruit with archaeology had been a Glose one since early in this century, particularly with the archaeologists and institutions of the United States that worked in the country. The first approach occurred when the company financed exploration and restoration works in Quiriguá, between 1910 and 1913, under the direction of Edgar Lee Hewett (1911, 1912, 1913). With him were Earl Morris and Sylvanus Morley, two men who dedicated most of their lives to Maya archaeology; for Hewett however, this was one of the few jobs he made outside the United States. As to the excavations themselves they have been very well done, with all the new advances in archaeology and with a great interest in the preservation of the site. They even carried out the partial restoration of Building 1, and for the first time they experimented with rubber molds to obtain copies of stelae and monuments. Allworks were partly financed by United Fruit, who also provided transportation and accomodation in the banana plantations. They also gave back to the state the land where the site was located, which in turn had been donated to the company by dictator Estrada Cabrera at the beginning of the century. Anyway, Hewett never allowed that the enterprise stood as the organizer of the academic activities; this was left to his own institution. Shortly before, Philander Knox, State Secretary of the United States, had visited the ruins on his way to Honduras. This visit is very significative, as Knox was going to sign an agreement in Tegucigalpa for United Fruit, for tax exemptions and other royalties granted by dictator Bonilla in acknowledgement for the collaboration of the enterprise in the overthrow of president Dávila. The following year, the controversies between United Fruit and Cuyamel, each one at a different side of the border, led to a declaration of war between the two countries. It was then when United Fruit settled in Tela, where archaeologists such as Dorothy Popenoe, Concepción Turnbull, Zemurray’s daughter Doris Stone begun working in the field (Schávelzon 1986). At this point we should talk about someone who was important to Maya archaeology: Samuel Zemurray. There are no references to him in the history of Mesoamerican archaeology, but he played quite an important role in this field. He arrived to Mobile, Alabama, at the beginning of the century, from the Near East, and he begun his relation with the banana industry in New Orleans. There he had the imaginative idea of beginning to buy to United Fruit the banana bunches that the company threw to the river because of their poor condition, to sell them again at minimum prices. In just a few years he had founded the Zemurray and later on the Cuyamel Company, with a 60% of capital of the United Fruit. With a competitive vision and quite an aggressive attitude, he became in a few years the Banana King, owner of plantations in six countries. In 1929 he was director and first stockholder of the United Fruit that had made him rich. In 1924, Zemurray made the donation of the funds necessary for the opening of the Middle American Research Institute, in Tulane University, under the initial direction of William Gates; the role played by this institute in Maya archaeology needs no further comments. Zemurray made other donations of money, sometimes important amounts, for archaeology, and he gave facilities for equipment, technology and transportation in the Maya area. In the middle of the national revolutionary times, culture was one of the aspects mostly favored by Arévalo’s administration, who did not left archaeology aside. At the beginning, archaeology was considered as a means of rescuing the national patrimony of the people, with the capacity of encouraging nationalistic ideas and the value of the traditional indian culture. In this framework, United Fruit decided to back up a big project, the main objective of which consisted in putting back to shape a group of buildings accessible to tourism, near some important city. This would also allow for an improvement in the image of the company -which was being strongly criticized for opposing the salary increases and the new Labor Code-, and promoting the entire subject in the United States. It was also decided that the excavation was to be carried out with all the scientific advances of the times in archaeology (Dimick 1947a). They begun with the election of the site. A group of archaeologists gathered under the direction of John Dimick -he led the project later on-, who visited several places in the Highlands: it was clear that a site was required with “an architecture well enough preserved so as to allow a minute reconstruction” (Woodbury and Trik 1953:1). That is to say they were not looking for a site potentially interesting for archaeology, which could, because of its features, help resolve some hypothesis set forth before. It simply had to be a big place, imposing and accessible, and the site was finally Zaculeu, near Huehuetenango. What kind of a site was Zaculeu by then? If we read the publications made by United Fruit, we have the image of an abandoned place, untouched, never explored before. This is very curious, inasmuch as Zaculeu was precisely one of the most visited and surveyed places in the Highlands. An anthology of what was known by then can be seen in Antonio Vilacorta’s work (1930), and we must point out that Jorge Acosta (1930) had already drawn up several maps, together with Bertha Dutton and Hilda Hobbs (1938). In 1927 a mission of the Government Secretariat had cleaned up the place and accomplished a partial restoration, and though from the point of view of archaeology in 1946 this restoration could be considered not much scientific, it was a well done job, financed by the state in a first attempt to begin protecting the prehispanic cultural patrimony. No reconstruction had been done, only the consolidation of stuccos and the replacement of stones; and those sectors which could not be intervened were left covered with earth, for a better protection. The working team was formed by top specialists: John Dimick, A.V. Kidder as consultant of the enterprise, Stanley Boggs (until May 1949), Aubrey S. Trik as restoration architect, Daniel Murcia as superintendent, Edwin Shook as adviser and Gustav Stromsvik as archaeologist; Nathalie Woodbury was in charge of the historical investigation. And although for Boggs and Dimick this was their first work in the region, all of them were the very best that could be gathered in Central America at that time. They all had experience, specially Trik and Stromsvik, who had done very good jobs of restoration in Copán. The anthropological aspects were covered by T. Dale Stewart. The first publications helped to establish the objectives more clearly after the beginning of the works in February 1946. The three goals pursued were: 1) to recover objects for recreating the history of ancient inhabitants; 2) to preserve and make accessible the findings and the buildings, and 3) to reconstruct the buildings so that they could be further visited. The task undertaken from that point was directed towards reconstruction. And though at the time it was something common in Mexico to make anees prehispanic buildings, often going far beyond the evidences discovered, the case of Zaculeu went much farther they rebuilt completely, with platforms, stairways, walls and even part of the roofs, several buildings. It was the first and only time in America when a full lime covering was applied on a construction, to give it the appearance of being brand new. No need to say that there were left no evidences to recognize which parts were original -in case some such portion should have been left at sight- and which were totally new (Dimick 1948, Woodbury 1948). This aspect, the most negative and criticized at that time (Schávelzon. 1989), was the one that consumed the efforts and funds of the project and though the archaeological excavation was very correctly done, with an impeccable technique, the issue of reconstructing all the buildings became the core of the works, led to the search of tombs, and defined where to excavate and how, as later on everything would be covered with tons of modern cement. Thus, in the five following years, the platforms and floors of each pyramid and structure begun to be covered; in Structure 1 they even dismantled what had been restored in 1927. Apparently, the Mexican habit of rebuilding leaving the stone at sight was not enough: this was nothing less than Disneyland in a shiny day! The company, financing agricultural schools, reforesting and developping experimental farms, plays a capital role to improve the agricultural systems -as well as the econo misal condition- of the people of Central America. It also sponsors archaeological field works and researches to help discover and restore, for those people, their great cultural inheritance (Dimick 1947:1). … the calmness of the indian worker who is being measured is a tribute to his ingenuity. He could put aside his fear of the sinister medical instruments making a gane of the procedure: he expected two cigars for the best height, another one for the best teeth, and so on (Dimick 1947:14). This is an evidence of the ethnocentric vision and the deeply rooted racism, of the clever anthropologists who fool the candid indians for the sake of science. If we take a look at the development of reconstructions, it is easy to understand what has gone on. Let’s start with Structure 1, the biggest one, which had been partially restored in 1927. In that early work several terraces of the base had been done anew, though half of this base had remained as it was found. Now, all the stepped terraces were being done again, as also the stairways and a part of the upper walls up to one meter high. The centers that were missing because of the destruction or for the new explorations were completed, and there after a layer of lime was applied, to cover all the surface, so that it could look as it supposedly was in its origins. 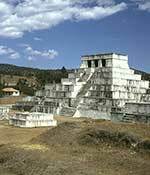 Only the height of the walls of the temple was respected, as they did not exceed the maximum level discovered. But in the following year this was no longer enough: the balautrade of the upper stairway was withdrawn to uncover a former epoch, and 11; was done all over again unifying it with the outer one; the result was something that had never existed in its origin. The upper temple was also completed: the walls and columns were built up and a flat roof was placed with a double moulding. There was some partial information on the temple, but anyway the work done responded much more to fantasy than to archaeological evidence. With the rush, they not only fell finto irreversible errors but also left asido archaeological exploration. According to the report, “Complete excavation of the various superimposed periodos was not possible because of the limitations imposed by the program of preservation” (Woodbury and Trik 1953:25). About the upper balaustrade they rote that “Complete information regarding these blocks was not available, but the illustrations of the restored structure show the most probably arrangement” (Woodbury-Trik 1953:30). Thus, they just made it anew without evidences, stating that its probable shape was the one they had chosen at their discretion. The other important structure, due to its size and the intervention accomplished, was number 4, which consisted of an elevated temple and two buildings with porticos at the sides. The base and the upper temple in the middle were rebuilt, including all the facade, taking as a standpoint a few original fragments; the North side was also done anew, while the South side was left as it was found. No need to say everything was also covered by brand new stucco. We must point out that there was not a complete dado left, not a single angle of the base, and the full height of the roof was unknown. By 1950 the works were finally finished. The situation in the country had been changing, and the good relations between the government and the company had vanished. United Fruit did not accept the working conditions imposed by the authorities and they were not happy for having lost the monopolies of transportation, mail services and electricity. The scandal concerning their peculation of the national treasury and of the stockholders themselves had already exploded in the United States. An interesting point is that the archaeologists finishe all the same their laboratory work -which has been excellent from the technical point of view- and published a big book in two volumes, in which figured at the foot the United Fruit Company and a dedication to Samuel Zemurray. In the same period, other works had been accomplished in Guatemala, which are useful to make comparisons. One of them was the excavation at Zacualpa carried out by Robert Wauchope in 1947. This work was a result of the enthusiasm of this archaeologist, who had been working in the site in 1935 for the Carnegie Institution, when he established the first ceramic sequence of the Northern area of the Highlands. Wauchope then directed the Middle American Research Institute, which as we have said before, had been created by Samuel Zemurray, to whom he turned looking for financial aid for this new excavation. Zemurray gave him 5.000 dollars (Wauchope 1948a and 1948b). Wauchope, who was a prestiged archaeologist, established a previous theoretical base. He made a small but thorough excavation, obtained valuable information, improved the ceramic chronology and reached a better understanding of the site. It was such a fruitful investigation that when many years later -between 1967 and 1968- the studies of pottery were reinitiated, researchers kept on obtaining valuable information for the regional history (Wauchope 1975). Publications were interesting and the presentation was good. The complete work, including both the first and the second seasons, was performed in the framework of a fluent relationship with the local archaeologists. They had archaeological objectives, nothing to do with politics or economy, and they reached the results they were looking for. Another case could be the excavations at Kaminaljuyú accomplished by the Carnegie Institution in those same years. That exploration yielded very valuable information, and in a joint work with the Instituto de Antropología e Historia, they could rescue and protect the central sector of the entire unit (Schávelzon and Rivera 1985 and 1987); unfortunately, the rest of it was destroyed due to the uncontrolled urban growth. This shows the variety of positions that the U.S. archaeologists and their institutions used to adopt in the countries of the continent, with different results in each case. Though the excavations in Zaculeu carne to an end in 1950, the publications were still issued until 1954, when Woodbury’s and Trik’s The ruins of Zaculeu carne to light, with the editorial foot of United Fruit Company. Parallel to this academical history, the enterprise and Arbenz’s government had declared a frontal war one another. During those four years the company contributed in 28 revolutionary uprisings to overthrow Arbenz (Arévalo 1954, Galich 1956, Cardoza y Aragón 1965) and in an international campaign aimed at impairing the reputation of the president, pursuing him for some fancy communist ideas, though as it has been said before, his project was clearly a capitalistic one, but at the same time an independent one. The handling of most of this operation fell on Spruille Braden, an ambassador who had been forced to leave Argentina because of his exaggerated macarthism. Braden had acted as Joined Secretary to the Department of State, and thereafter he became the Head of Public Relations of United Fruit. He was succeeded by ambassador Peurifoy, who had taken part in the coup d’état in Greece, which ended up with a military dictatorship. In the U.S. Senate, Henry Cabot Lodge, a stockholder of United Fruit, made his contribution to all this, and in 1954 he acted as president of the Security Council of the United Nations, not allowing the other countries to blockade the invasion which, from Honduras, ended in the overthrow of Arbenz. In the Gulf of Fonseca, two armored chips with 2500 marines backed up the invasion. The invading troops were under the command of Castillo Armas, who managed to obtain many million dollars and equipment; a good portion of his funds carne from United Fruit (Kepner and Soothill 1957, Atitlán 1954). The invaders penetrated through the lands that the company owned in Morales, and the ambassador of the United States transported Castillo Armas in his own plane to Guatemala, after his victory. Thus, it is easy to understand which was the popular feeling when the city of Guatemala was bombed by the U.S. Air Force and when the country was invaded by mercenary troops wearing American uniforms. But it was the new Republican government, and in the State Department was working John F. Dulles, the proxy of United Fruit, who as a lawyer had written and signed the contracts of 1930 and 1936. Not casually the first action of the new dictatorial government consisted in returning the land to the company and signing a large series of prebends and new tax exemptions. Fortunately for justice (…) we have approached the scientific knowledges of North Americans of clean eyes and of Europeans of an austere and generous science, wise men all of them and not only technicians of theft, who offer the unquestionable evidence of the existance, in freedom before and in oppression at present, of a spiritual world inspired in the highest human virtues and of a social order founded in the community and justice. This paragraph allows us to understand that their problem did not concern all foreign archaeologists, as it is often understood, but only against what some of them represented. The works in Zaculeu were never forgotten. How could ever happen that well known and prestiged archaeologists would have got involved in this gigantic farse, set up by an enterprise such as United Fruit? How could it happen that the academical objectives were left aside to priviledge those of monumental reconstruction? How did it happen that the researchers didn’t mind to be used to try to change an image impossible to modify through cultural actions only, in which the people didn’t have the slightest participation? As always, the ultimate allegation was that science had nothing to do with politics. Others still insist that as foreigners, they could not and they should not interfere in the internal politics of other countries. But didn’t the company that hired them widely interfere in these internal affairs The most difficult issue to understand is that even if they were not aovare of it, in doing precisely that archaeology in Zaculeu, they were backing up disgraceful policies for Guatemala. When situations such as this one can be seen and prevented in time, the barriers of nationalities will no longer be an obstacle for the archaeologists of the entire continent. Acosta, Jorge 1930. “Las ruinas de Zaculeu”, Anales de la Sociedad de Geografía e Historia, vol. VI, no.4, pp.454, 466, Guatemala. Adams, Richard N., 1960. “Social change in Guatemala and United States policy”, Social Change in Latin America, its Implications for U.S. Policy, Harper and Brothers, New York. Adler, John, Eugene Schlesinger and Ernest Olson, 1952. Las finanzas públicas y el desarrollo económico de Guatemala, Fondo de Cultura Económica, México. Arévalo, Juan José, 1954. Guatemala: la democracia y el imperio,México. Atitlán, José de, 1954. Guatemala: junio de 1954, relato de la invasión, de la caída de Arbenz y la resistencia popular, Editorial Fundamento, Buenos Aires. Cardoza y Aragón, Luis, 1965. Guatemala, las lineas de su mano, Fondo de Cultura Económica, México. Conferencia Universitaria Centroamericana, 1978. Estructura agraria, dinámica de población y desarrollo capitalista en Centro América, Editorial Universitaria, Costa Rica. Consejo Nacional de Planificación Económica, 1978. Cuadros estadísticos de población, censos 1950, 1964, 1973. Secretaria General del Consejo, Guatemala. De la Borbolla, Daniel Rubín y Hugo Cerezo, 1953. Guatemala: monumen­tos históricos y arqueológicos, Instituto Panamericano de Geografía e Historia, Guatemala. Department of State, 1954a. Intervention of International Communism in Guatemala, Publ. 5556, Washington. Department of State, 1954b. Penetración del movimiento comunista in­ternacional en las instituciones de Guatemala, amenaza para la paz y la seguridad de América, Washington. Dimick, John, 1947a. Zaculeu: restoration by United Fruit Co.,MiddleAmerican Information Bureau, New York. Dimick, John 1947b. The Age of Zaculeu, United Fruit Co., New York. Dimick, John, 1948. “Zaculeu, a highland Maya restoration study”, El Palacio, vol. LV, pp.201, 209. Dimick, John 1955. “La edad de Zaculeu puede ser el doble de la que convencionalmente se le supone”, Antropología e Historia, vol.VII, no.1, Guatemala. Dirección General de Estadística, 1942. Quinto censo general de población (7-4-1940), Guatemala. Galich, Manuel, 1956. Por qué lucha Guatemala; Arévalo y Arbenz, dos hombres contra un imperio, Elmer Editor, Buenos Aires. Geiger, Theodore, 1953. El comunismo contra el progreso en Guatemala, National Planning Association (Spanish version), Guatemala. Gobierno de Guatemala, 1951. Mensaje Quincenal, Dirección General de Estadística, no. 19 (31st July), Guatemala. Hewett, Edgar Lee, 1911. “Two seasons’s work in Guatemala”, Bulletin of the Archaeological Institute of America, vol.II, no.3, pp.117- 134. Hewett, Edgar Lee, 1912. “The third season’s work in Guatemala”, Bulletinof the Archaeological Institute of America, vol.III, pp. 163­171. Hewett, Edgar Lee, 1913. “The excavation of Quiriguá by the School of American Archaeology”, XVIII International Congress of Americanists, pp. 241-248, London. Hewett, Edgar Lee, 1916. “Latest work of the School of American Archaeology at Quiriguá”, Holmes Anniversary Volume, pp. 157-162, Washington. Hewett, Edgar Lee, 1936. Ancient life in Mexico and Central America,Bobbs-Merril Co., Indianapolis. International Bank for Reconstruction and Development, 1951. The economic development of Guatemala, Washington. Kepner, Ch.D. and J.H. Soothill, 1957. El imperio del banano: las compañías bananeras contra la soberanía de las naciones del Caribe,Triángulo, Buenos Aires. May, Stacy and Galo Plaza, 1958. The United Fruit Co. in Latin America,United States Performance Abroad, Washington. McCann, Thomas, 1979. An American Company: the tragedy of United Fruit Crown Publishers, New York. Melville, Thomas and Marjorie, 1971. Guatemala: the politics of land ownership, Free Press, New York. Molina Abril, René, 1971. Estudio de la mortalidad infantil en Guatemala, Edition by the Author, Guatemala. Noval, Joaquín, 1965. “Situación económica actual de los indígenas de Guatemala”, Cuadernos de Antropología, no. 6, pp. 7-23, Guatemala. O.I.T., 1953. Poblaciones indígenas: condiciones de vida y trabajo de los pueblos autóctonos de los países dependientes, Geneve. Orellana, René, 1978. Guatemala: migración de población 1950-1973,Instituto de Investigaciones Económicas y Sociales, Universidad de San Carlos, Guatemala. Shattuck, George Ch. 1938. A medical survey of the Republic of Guatemala, Carnegie Institution, Washington. Schávelzon, Daniel, 1979. “El saqueo arqueológico de Guatemala”, Antropología e Historia, no. 22, pp. 57-61, INAH, México. Schávelzon, Daniel, 1981a. “Algunas supervivencias de cultos prehis­pánicos en Guatemala”, Proyecciones de América Latina, no.1, pp. 103-126, México. Schávelzon, Daniel, 1981b. “Historia social de la restauración arqui­tectónica en México”, Vivienda, vol.6, no.5, pp. 434-477, Mexico. Schávelzon, Daniel, 1984a. “Conservación y restauración en el subdesarrollo”, Trama no. 33, pp. 24-28, Quito. Schávelzon, Daniel, 1989. La conservación del atrimonio cultural en América Latina: restauración de monumentos prehispánicos en Mesoamérica, 1750-1980, Ph.D. Dissertation, UNAM, México. Schávelzon, Daniel, 1988. “Las excavaciones en Zaculeu (1946-1950)”. Recent Studies in Precolumbian Archaeology, pp. 167-190, Bar Archaeological Series, Oxford. Schávelzon, Daniel y Víctor Rivera, 1985. “Proyecto de restauración en la ciudad de Guatemala”, Documentos de Arquitectura Nacional y Americana, no. 19, pp. 81-89, Resistencia. Schávelzon, Daniel and Victor Rivera, 1987. “La destrucción de Kaminaljuyú”, Mesoamérica vol. 14, pp. 535-551, South Woodstock. Tax, Sol, 1953. Penny capitalism, a Guatemalan indian economy, Smithsonian Institution, Publ. 16, Washington. Teller, Chester and Vernon Bent, 1977. Demography factors and their food and nutrition policy relevance: the Central American situation, Instituto de Nutrición de Centro América y Panamá, Guatemala. Toriello, Guillermo, 1955. La batalla de Guatemala, Cuadernos Americanos, Mexico. Torres Rivas, Edelberto, 1981. “Guatemala: medio siglo de historia política. Un ensayo de interpretación sociológica”, América Latina: historia de medio siglo, Siglo XXI, México, vol. 2, pp. 139-173. United Fruit Company, 1899-1950. Annual Reports, Unifruitco, Boston. United Fruit Company, 1946. Proyect Zaculeu, Middle American Information Bureau, New York. Wauchope, Robert, 1948a. Excavations at Zacualpa, Middle American Research Institute, New Orleans. Wauchope, Robert, 1948b. “Tulane expedition to Guatemala”, El Palacio,vol. LV, pp. 16-18. Wauchope, Robert, 1975. 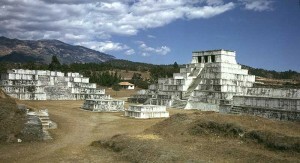 Zacualpa, El Quiché, Guatemala: an ancient provincial center of the Highland Maya, Middle American Research Institute, New Orleans. Woodbury, Richard, 1948. “Progress at Zaculeu, Guatemala”, American Antiquity, vol. XIV, no.2, pp. 121-122. Woodbury, Richard and Aubrey Trik, 1953. The ruins of Zaculeu, 2 vols., United Fruit Co., Richmond. Esta entrada se publicó en México & Guatemala y está etiquetada con América Central, Arbenz, archeaology, arqueólogo, arqueología, arqueología urbana, arqueologia argentina, arquitectura precolombina, arquitectura prehispánica, arte, Centroamérica, ciencia internacional, ciencia nacional, culturas precolombinas, culturas prehispánicas, Daniel Schávelzon, Guatemala, internacional science, Juan Arévalo, maya, mayas, México, Mesoamérica, national science, Quiriguá, Schavelzon, sitios arqueológicos, Ubico, United Fruit, Zaculeu en 4 agosto 1986 por Daniel Schávelzon.